So where could Clavia go from there? I suppose that they could have tweaked a bit of this, tinkered with a bit of that, and maybe even updated some of the other, but that wouldn't have justified the transition from a C1 to a C2. No, something more was required, and the C2 is no longer three organs in a box, but four. The new addition is a Baroque pipe organ. To understand three‑quarters of the C2, I should direct you to my review of the C1 because, for the most part, the two instruments — resplendent in their red, lacquered livery — are the same. Nonetheless, the C2 isn't quite a C1 with a fourth instrument shoehorned in. For one thing, the over-loud Hammond key‑click in the C1 is now the subject of a high/normal/low volume parameter, so you can tame it a little. This sounds trivial, but it's not. It makes a huge difference. The Leslie speaker emulation has also been updated. The current operating system (v1.20) adds a second rotary speaker model to the initial release, and fixes a bug in the delay unit. I prefer the new speaker model, which is selected using a menu option so new that it isn't even included in the crib sheet printed on the C2's control panel. Physically, the control panels of the C1 and C2 are also different, with many of the control sections moved around so that the percussion and chorus/vibrato controls are now arranged more like those of a Hammond. What's more, the C2's nomenclature has been updated. Whereas the C1 offered Upper and Lower manuals, the C2 directs you to the Swell and the Great, which are names drawn from traditional organs. Clavia also claims that the manuals themselves have a firmer action. I don't have a C1 to hand to make a comparison, but I have no reason to disbelieve this, and the keyboard feels good, so I'm not going to quibble. There are also improvements to the output routing options, which now allow you to determine which of the electric organs are directed to the standard L/R outputs, and which are directed to the high‑level output and Leslie speaker socket. This means, for example, that you can route the Hammond to a real Leslie while directing the other organs to a PA or combo amplifier, which will be superb for live use. 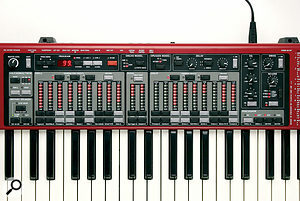 In addition, a new 3.5mm stereo monitor input allows users to connect playback devices such as iPods for accompaniment or practice purposes. Unfortunately, the audio presented here is replayed only through the organ's headphone socket, which is daft. Make it an option, but not the only option! The only other criticism I would direct at the instrument as a whole is that the power supply in the review unit hums. Not noticeable in most environments, it may start to annoy you in a quiet studio, so you should check this out. The C2's control panel is broadly similar to the C1's, and is again centred around three panels of button‑based drawbar emulations — this time authentically named. So now we come to the pipe organ itself. Quite apart from the nature of the sound, there is a fundamental difference between this and the other organs in the C2: whereas the Hammond, Vox and Farfisa sounds are modelled, the pipe organ is sampled. This means that it is subject to the usual deficiencies of multisampling, whereby small groups of notes can sound subtly (or sometimes not so subtly) different from those alongside them. This is apparent on some of the ranks, although not so noticeable when using complex registrations and effects. Selected and deselected using the drawbar in/out buttons, there are 21 stops on the C2 and, as on a genuine organ, couplers allow you to play the stops of one manual on another, either at the original pitch or transposed an octave up (super‑octave) or down (sub‑octave). Starting with the Swell division, the first stop is an 8' Fugara. The tone of a Fugara tends to lie somewhere between the family of thinner pipes known as strings, horns and reeds. The rank sampled here is full but, in common with many of the C2's stops, speaks slowly, which is nice. Second comes the Rohrflöte, or Chimney Flute, which is a form of half‑stopped pipe. Unlike open pipes (which produce the full harmonic spectrum) stopped pipes produce only odd harmonics. Placing a hole in the stop ('half‑stopped') and adding a chimney allows the organ builder to determine the mix between the odd and even harmonics and, therefore, the tone. This rank is at the gentle end of the spectrum, and turns out to be the softest of all the 8' stops on the C2. The third rank is a 4' diapason, also known as a 4' Principal or Octave. Together with the 8' diapason, this is the most important and most widely used rank on a pipe organ, and it provides a commanding tone that forms the bedrock of many registrations. Next comes the 4' Spitzflöte, or 'spire flute'. These pipes are tapered toward the top to create a thinner tone that lies somewhere between that of a flute and a string. This one mixes well with the 8' stops to create brighter, but not strident registrations. The Nazat (or, more commonly, 'Nazard') is a 'fifth' rank that lies at the same pitch as the 2⅔' drawbar on a Hammond. Unlike the ranks described so far, there is no absolute form for this: the name refers to the pitch rather than the type of pipe. The one sampled here is clearer and less breathy than many of the stops on the C2, and it does its job admirably. The name Flute is often used to describe any pipe that has no significant distinguishing characteristic, and the 2' Flöte is one of these, offering a pure tone that I like a lot. In contrast, the name Vox Celeste (and its many variations) is used for a specific type of string rank. This one has a complex tone with prominent harmonics. It speaks slowly in the lower registers, and has an almost human quality, as it should. The Scharf II‑III is a 'mixture'; two ranks in the lowest octave, then three ranks pitched two, two and a half and three octaves above 8'. Many Scharf ('sharp') stops have more than three ranks, but this one doesn't suffer from the lack. 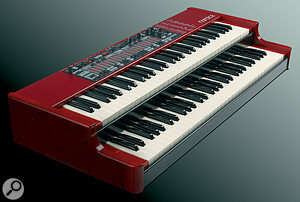 It's very bright, and can be used to create the more strident, ensemble tones of a larger organ. Finally, on the Swell, we come to the 8' Oboe. These reed pipes are conical with a bell at the upper end, and they produce a much brassier tone than the various flues. Individually, its notes sound fabulous but, perhaps because there is so much more body and harmonic content, the multisampling is more obvious than on the other ranks, and a bit disconcerting in places. All of the C2's connections — including, perhaps annoyingly, the headphone output — are found at the rear of the unit. Moving on to the Great division, the first stop is an 8' Principal. On some organs, this is the 4' Principal blown an octave lower, but on the C2 it is a different rank, warmer and with a lesser harmonic content. Second comes an 8' Gamba, a form of string rank, with a thinner tone that exhibits more overtones than some of the other flues. Alongside this lies an 8' Gedackt, a rank normally made of stopped wooden pipes. The one sampled here has a lovely, liquid, breathy timbre rich in overtones, quite different from the other ranks. Although you might expect the 4' Octava on the Great to be identical with the 4' Principal on the Swell, it's not. It has a deeper tone without the obvious second harmonic of the Principal. Similarly, you might expect the 2' Octava to be a transposed version of the 4' rank. Nonetheless, it's audibly different, albeit of similar tone and character. And again, whereas you might fear that the 4' Rohrflöte on the Great is a transposed version of the 8' Rohrflöte on the Swell, it's not. The two are similar, but the 4' rank has a prominent percussive attack that lends it — and registrations that include it — a distinctive character. The Qvinta (or 'Fifth') fulfils the same function as the Nazard on the Swell, but with a louder and more strident tone. Again, the name describes the function of the rank, not its construction, and the Qvinta's pipes sound metal to me, whereas the Nazard's sound wooden. Mixtur III IV appears to include three ranks at the bottom of the scale and four in the mid‑ and upper reaches. These are drawn from the octaves and fifths of the root, so this stop is important when creating larger, cathedral‑style registrations. Finally, we come to the Trumpet 8'. On a pipe organ, trumpets are reeds, so they often have more of the character of an oboe than that of a brass instrument. This one is very loud and brassy, so you have to use it with care. Nonetheless, with a touch of tremulant (see below) you could easily use it as a solo oboe. There are three stops for the bass pedals, which you can also play from the bottom two octaves of the Great. The first is the 16' Sub, which has a lovely woody timbre, and is very breathy in its lowest register. This is coupled to a 16' Fagot (or, in English, Bassoon), a reed rank that can only be used together with the Sub. On many organs, these would be detuned from one another to create a chorusing effect, but the effect here is very mild. The last stop is an 8' Gedackt. You know the sound that you get when you blow across the neck of an empty glass bottle? Well, that's what this sounds like and, far from being a continuation of the 8' Gedackt on the Great, it has its own, distinctive character. The pipes of a pipe organ are often housed in multiple enclosures, one for each manual. Traditionally, the Swell enclosure had vertical shutters ('shades') on the front and, when closed, these reduced the high‑frequency content of the sound as well as its loudness. When the organist pressed the pedal to open the shades, the sound swelled in both volume and brightness, and this is one of the most distinctive characteristics of a pipe organ. Clavia's engineers have modelled this faithfully, for which they earn many brownie points. In addition, baroque organs offered an animator called a tremulant. This varied the air pressure to create a form of amplitude modulation called tremulance (or, in modern parlance, tremolo). The C2 offers six tremulant speed/depth options which, when used with the appropriate registrations, are capable of creating sounds ranging from solo flutes and oboes to imitations of the Clavioline, and all manner of weird and wonderful '60s sci‑fi timbres. Indeed, a pipe organ can be much more creative than you might expect, and I think that the C2's will appeal equally to traditional church organists, modern musicians, and we sad cases who still think that Keith Emerson's prog‑rock excesses on cathedral organs are pretty amazing. Of course, much of the impact of a large pipe organ comes from its environment. The acoustics of churches and cathedrals are characterised by a long pre‑delays followed by extended reverberation. Although basic, the C2's delay and reverb effects allow you to create the impression of all manner of acoustic spaces, including — at their extremes — some that are quite cavernous. The results can be glorious. At the other end of the scale, simple registrations with just a couple of stops and minimal effects can produce wonderfully delicate Renaissance and Baroque sounds. My biggest problem with this review has been stopping playing long enough to write anything. Sure, some of the expensive pipe-organ emulations from dedicated manufacturers such as Rodgers are superior, but the pipe organ in the C2 is far, far better than you have any right to expect. Indeed, when you realise what each of the four organs in the C2 costs, the whole thing starts to look irresistible. Where else can you find emulations of a Hammond C3, a Vox Continental II, a Farfisa Compact Duo and a church organ for £500$900 each, with an amp modeller, Leslie rotary speaker, digital delay and digital reverb thrown in for free? Get your wallet out. 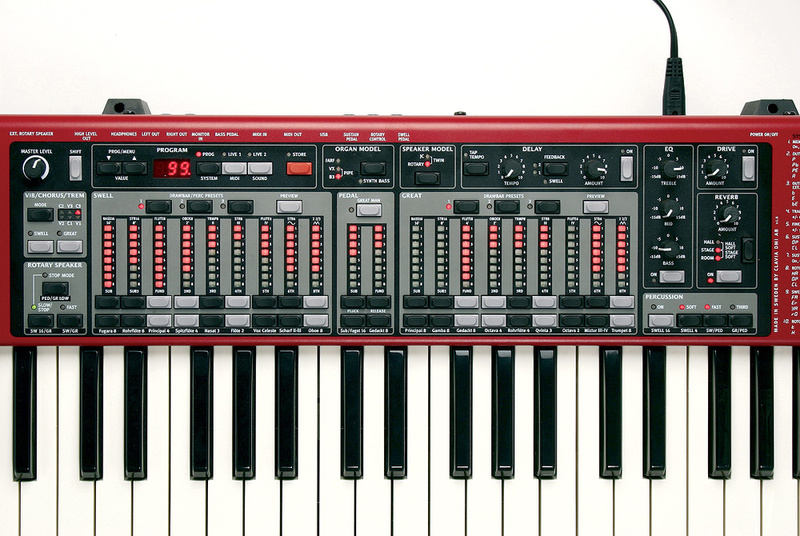 Many players will view the C2 as a Hammond emulator so, for them, it will compete against the likes of the now‑discontinued Korg BX3, the Roland VK88, and Hammond's own Pro‑XK range, all of which are excellent instruments. Alternatively, if you're after a low‑cost, non‑console pipe organ emulation, something like the Rodgers MX200 module is probably your first port of call. But while each of these covers some of the same ground as the C2, none covers more than a fraction of it, and they tend to be more expensive. The C2 really is a unique instrument. Pipe organs create their sounds by driving wind through two types of wooden or metal pipes: flues (not flutes) which, like a recorder, use an edge (or 'fipple') to set up the oscillation, and reeds which, like a clarinet or saxophone, use a vibrating reed. There are many subsets of these types, such as flutes, diapasons and strings (all of which are flues). A set of pipes of designed to create the same tone at the same volume but at various pitches is called a rank. The control that determines whether wind enters a rank and at what pitch is called a stop, although this name is also used ambiguously to describe the rank itself. The organ may have multiple keyboards, called manuals, and each manual will have multiple ranks assigned to it, often differentiated into divisions — one for each manual. The C2 will soon boast a dedicated, though optional, aluminium stand. Its splayed legs make room for the new (also optional) 27‑note MIDI pedal board, which comes complete with an integrated swell pedal. The other new accessory is a wide music stand coated in a non‑slip rubber finish. Together with the existing carry case and half‑moon switch for controlling the Leslie effect, I would have the lot. When you consider the number and the quality of the instruments on offer, the C2 starts to seem like very good value indeed. For a double-manual keyboard, it's surprisingly light and manageable. At this value, it would be churlish to criticise. By choosing not to squeeze pianos and synthesizers into the same instrument as an organ, Clavia have come up with a keyboard that is focused on what it does, and does it extremely well. 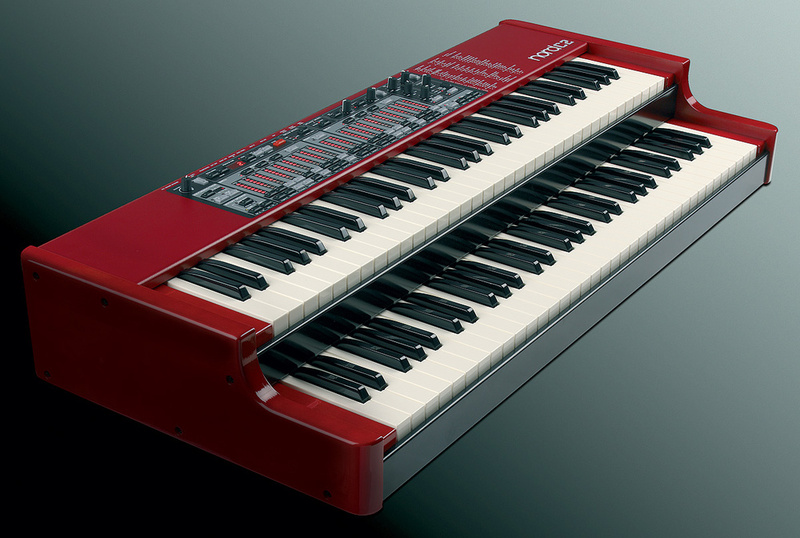 Its Vox and Farfisa models were excellent in the C1, and the improvements in the C2's Hammond emulation have cemented its status as first‑class. Add the pipe organ and the whole package represents remarkable value for money. As far as I'm aware, there's no competition.